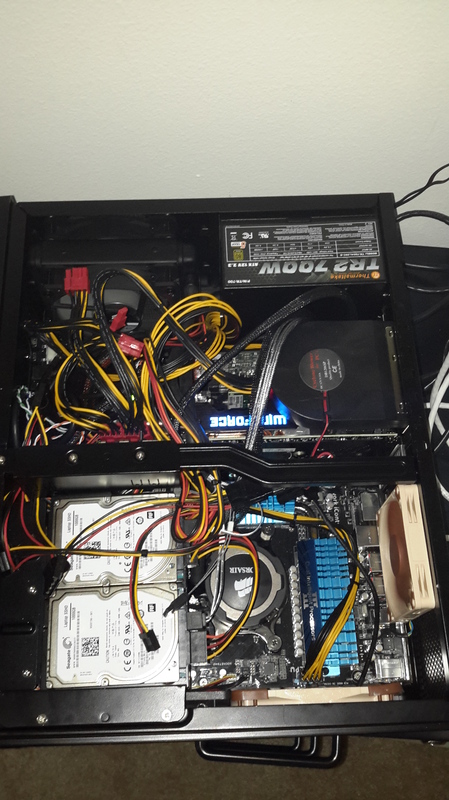 AMD HTPC Build – Addendum: Houston, we have a problem! So the cooler for the final build is the Corsair H75 rather than the Noctua. Price was about the same though ($75 vs $60) and the temps are now good. The system is also quieter, so it is well worth it +$15. Astute readers may have noticed that the GPU pictured above is not the Asus. Read on! 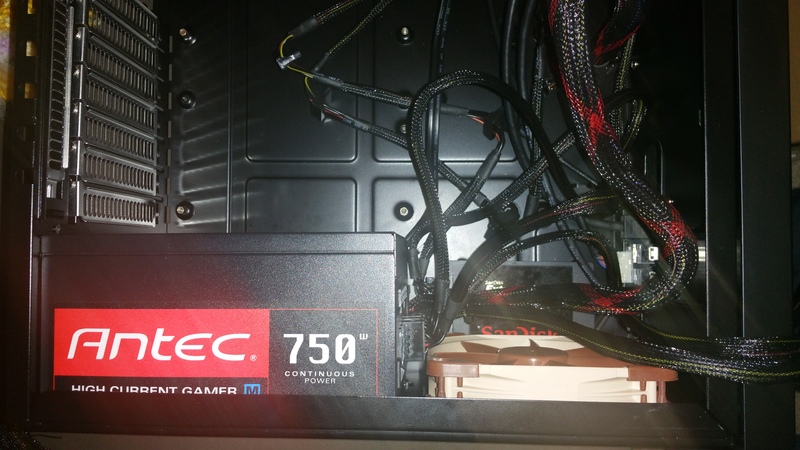 PSU: Antec HCG-750W High Current Gamer – Once again, the shots above provide a clue. The 170mm Antec was still just too big given the modular connectors stick out a bit. 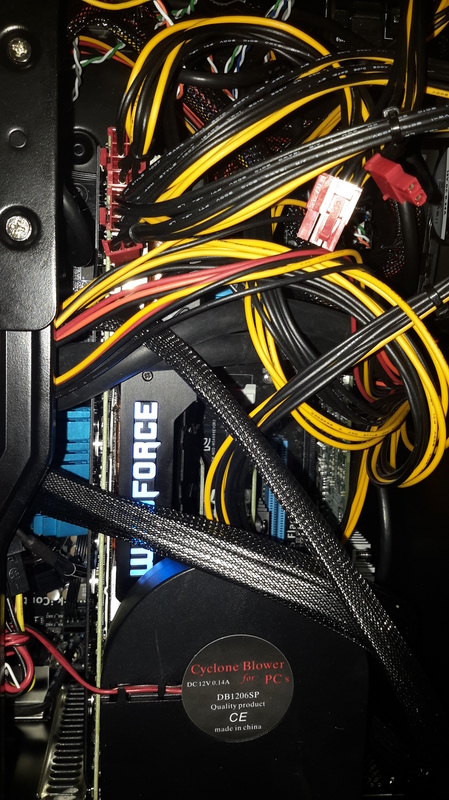 With a 120mm fan in place it was doable because the fan edge and modular connector could press into each other (pictures of that below), but with the H75 rad in place it wouldn’t have even been close. I decided to go big, or in this case super small, and get a very compact supply. This limited the build to 700W, but even with an R9 390x and the FX-8370 this is ample given that we won’t be overclocking at all and the drive array is laptop drives. I’ve had great success in the past with Thermaltake and the 700W TR2 is a fantastic unit at a mere 140MM and 80+ silver rating. Needless to say, the pics show how this supply leaves room to spare for the radiator. Luckily at only $70 this one was a cost savings for a change. -$40. OK that’s it for this entry! The total change in cost is +$85, for a total of $2768, but at least it’s all working now! Next up, logical configuration so stay tuned! 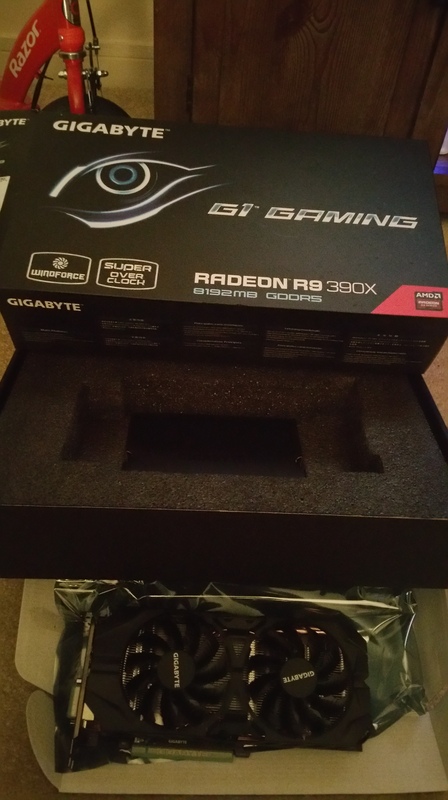 AMD HTPC Build Part II – “On the Cheap” gets air quotes!